92% of the 1,385 dehydrator reviews are 4- to 5-star ratings. This 9-tray machine will make the most snacks at once. The stackable trays are BPA free, and your product is protected under a 10-year extended warranty. The materials don’t really feel like a top-of-the-line appliance, which the Excalibur Food Dehydrator definitely is. 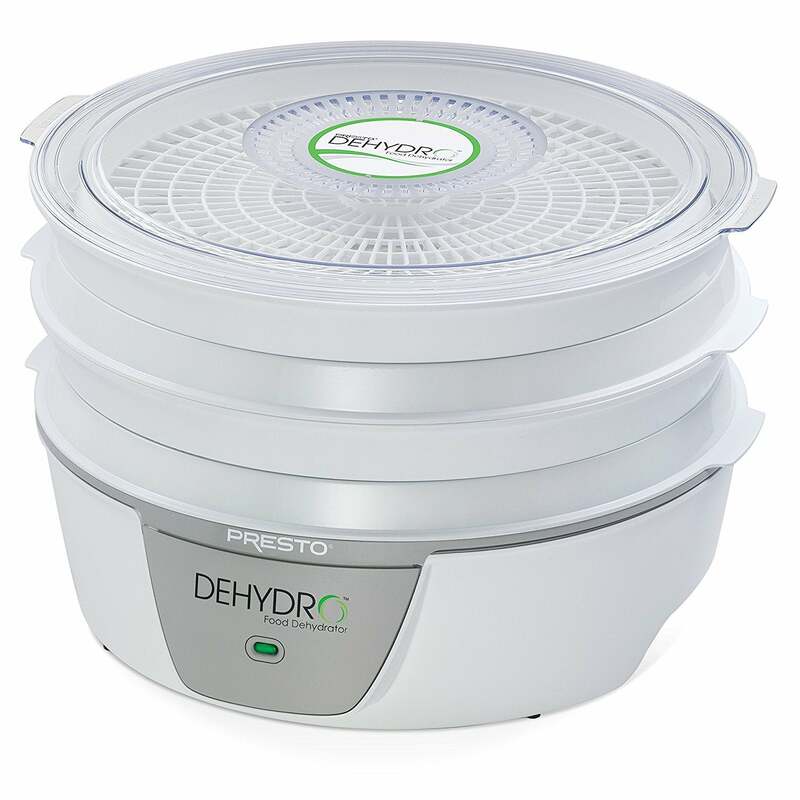 The Presto dehydrator is good for beginners. It’s the cheapest on our list but also the most basic. A simple design with quality materials, this machine is easy to use. You’ll only get 4 trays to start with. There isn’t a timer or temperature control on this model. This is probably better for occasional use to make small batches of snacks. You can watch the magic happen through the clear lid. It’s BPA-free and the lightest on the list. Mixed reviews due to lack of temperature control causing trays to melt. No fan, but quiet. Must rotate every couple of hours to prevent melting. It takes a while to warm up, so longer runs seem to be more efficient. This appliance is extremely quiet and lightweight. Customers love how easy it is to clean. It’s only covered under a limited 1-year warranty. Cuisinart is a trusted brand name with a 3-year warranty. All 9 trays are BPA-free. We also loved the multiple temperature settings. No timer on this one. The fan-only setting is nice to have, but a little louder than expected. As with most specialty appliances, a purchase journey can come to a screeching halt with one question: Am I really going to use this thing? We asked ourselves the same question when we started our food dehydrator review, but after learning just how many versatile snacks you can make—and how long they can last—our buyer’s remorse was no more. Here, we present the five best dehydrators along with a full how-to guide for choosing a dehydrator, using it, and storing and enjoying dried snacks. Food dehydrators are specialty appliances that can save you money and minimize food waste. A bag of dried fruit can cost $5 to $15 at the grocery store. Now, instead of throwing out two bad bananas in a bunch you’ve already bought for 64 cents, you can dehydrate overripe produce to extend its shelf-life and get the most out of your money. Dehydrators essentially dry fruit, vegetables, and meat at a relatively warm temperature over time while still preserving most of the food’s nutritional value. For example, herbs take one to four hours of drying time at 95 to 115 degrees Fahrenheit. Jerky takes about five hours at 160 degrees Fahrenheit. Apple slices take six to eight hours to dehydrate at 135 degrees Fahrenheit while bananas typically take longer—between 10 and 15 hours. As with any specialty appliance, you’ll want to think critically about how often you’ll realistically use a food dehydrator. When you do use it, what will you make? A handful of herbs or pounds of jerky? We’ve created a guide below to help you answer these questions and find the best food dehydrator for your needs. 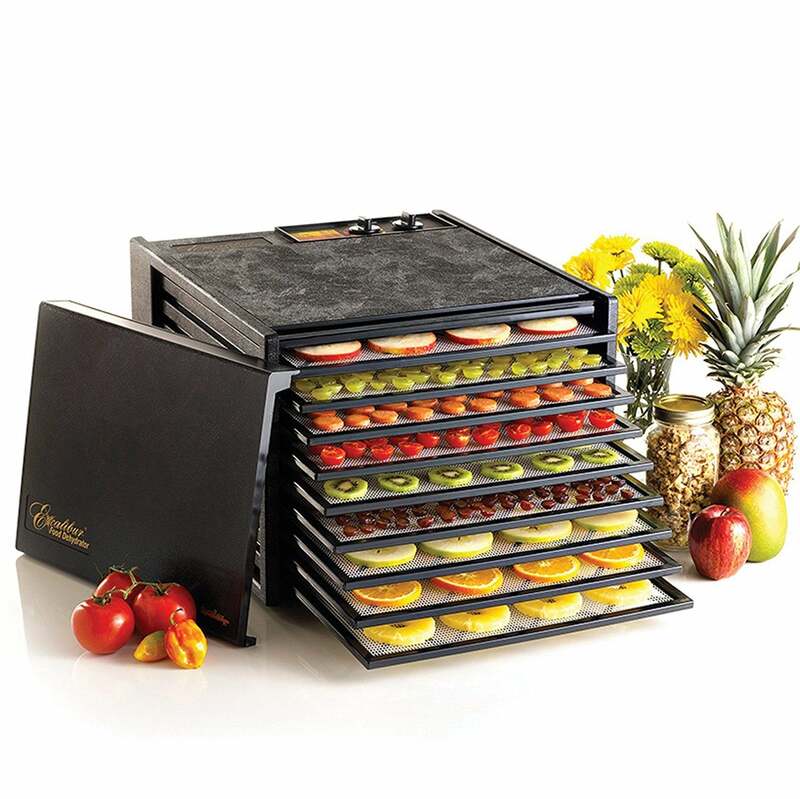 The Excalibur Food Dehydrator is the only shelf model on our list. It’s a higher ticket item, but worth every penny. Nine BPA-free trays of food can keep a pantry fully stocked. As a shelf model, food and flavors remain separated during the drying process. It also has a temperature control and timer, which a lot of food dehydrators are surprisingly missing. 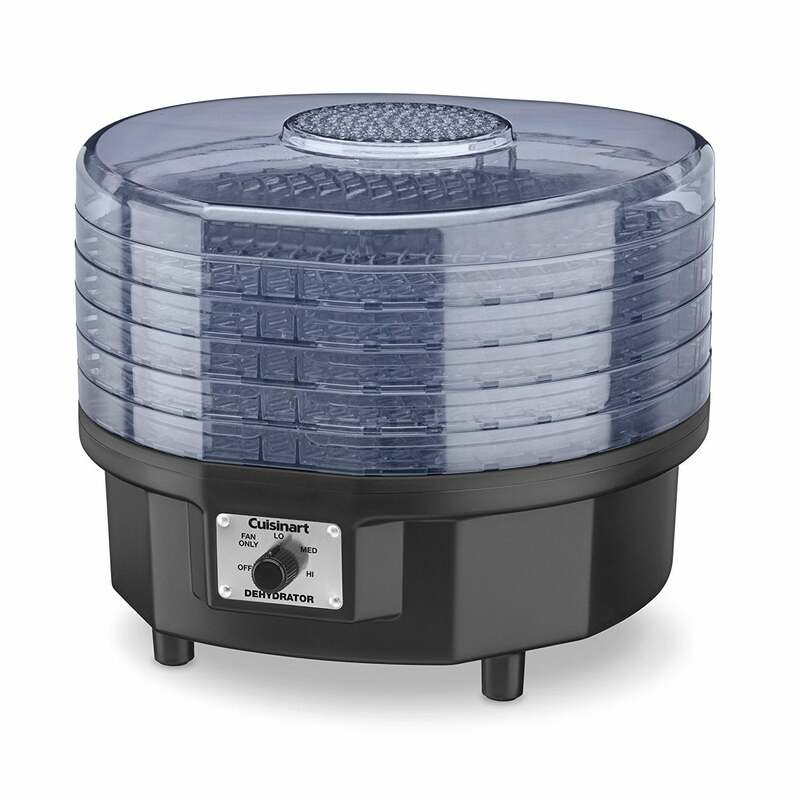 If you’re a carnivore, you’ll love using this meat dehydrator to make big batches beef jerky. Stacked: Round or square machines that dry food by blowing warm air over trays—usually from bottom to top, but sometimes vice versa. Pros: They’re cheaper, more compact, and easy to store. Cons: You must rotate trays more often for even dehydration, and it doesn’t work as well for meat. Juices have a tendency of dripping, which can potentially damage the heating element. Shelf or box: Food is dehydrated with warm air blowing horizontally across trays that sit on shelves. Pros: There’s no rotating required. It works great for all food: fruit, vegetables, and meat. You can usually make bigger batches more frequently. Cons: They’re more expensive and usually bulkier than stackable models. The placement of your appliance could affect its efficiency. Set it up in a warm, dry place away from vents and windows since air conditioning and humidity can interrupt or prolong the dehydration process. Patience is everything. Many dehydrators don’t even come with a temperature control or timer. If yours does, don’t crank the temperature to expedite the process. A higher temperature will only seal moisture into the food, which will make it more likely to spoil. Food should be 95% dehydrated before you can safely store them for an extended period of time. Snacks should be hard, crunchy, and breakable. Calling all Doomsday preppers! Dehydrated foods can last for years. If prepared and stored properly, dried fruit can be stored for five years. Dehydrated vegetables have an even longer shelf life, pushing a decade. Allow snacks to cool before storing them in a container to prevent condensation build-up. If you plan to store snacks for a longer period of time, use a vacuum sealer before placing them in a cool, dark, and dry area. You can enjoy dehydrated foods on their own, as chips or roll-ups, in salads, and as garnishes. You can even make dog treats. It’s also possible to rehydrate dried food. Simply combine one cup of water per cup of dehydrated food and let it soak for a few hours. Stacked models tend to be better for herbs, fruit, and vegetables rather than meat, but the Nesco Snackmaster Pro actually comes with three spice packets for making jerky. That’s saying something. 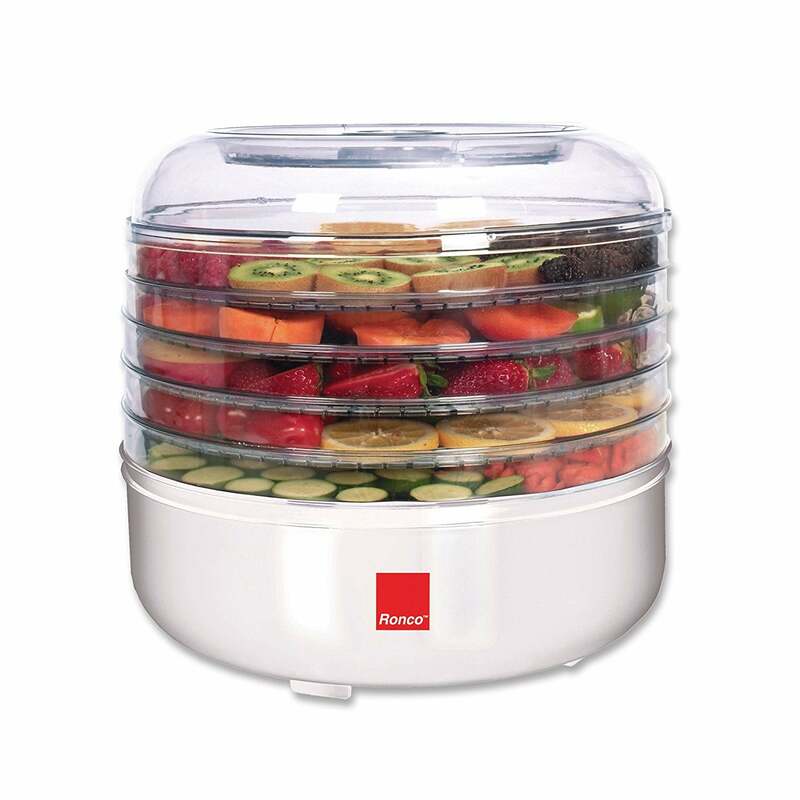 Unlike many dehydrators, the Nesco has an adjustable thermostat. Some accessories, like two fruit roll sheets, are included too. At a mid-tier price, we think the Nesco is the best bang for your buck, especially for those who aren’t confident they’ll use a dehydrator often enough to justify spending hundreds of dollars. 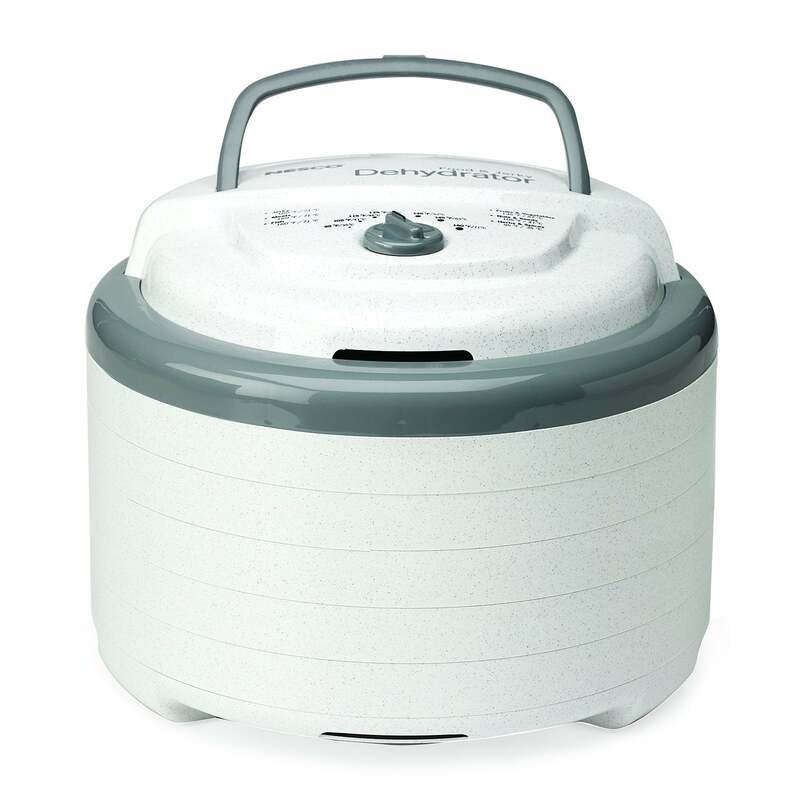 You’ll find round and square dehydrators. Round models can be more compact and take up less counter or cabinet space, but liquids can drip onto the heating element of the machine. The size of the appliance will, of course, affect how much food you can dehydrate at one time. Most machines have four to 12 trays. A mounted fan can be found at the top, bottom, or side of the dehydrator. Top and bottom fans with a vertical airflow will require trays to be rotated. Side fans will dry foods more evenly with a horizontal airflow across trays. Many dehydrators have a fixed temperature with no temperature control at all. If you’re craving a specific snack, you’ll want to make sure the dehydrator can reach the right temperature range. Dehydrating food is a slow process, taking up to 12 hours sometimes. A built-in timer is convenient for longer drying jobs that may complete while you’re asleep. The dehydrators we reviewed range between $40 and $300. Shelf or box models will be more expensive than the stacked models; however, you’ll get a larger, more evenly dried batch out of a shelf model. If you’re limited on storage space and you don’t expect to make (or want) a year’s worth of jerky, a stacked dehydrator will work just fine. What should I look for when buying a dehydrator? The National Center for Home Food Preservation has a great checklist to consult before you buy. This list includes four to 10 trays, an enclosed thermostat of 85 to 160 degrees Fahrenheit, at least a one-year warranty, and the Underwriters Laboratories (UL) seal of approval. A timer and temperature control are also nice to have. What is the best wattage for a food dehydrator? The 500-watt range is normal. Four of the five dehydrators we reviewed have a wattage between 600 and 620. The Ronco uses only 125 watts, so it may take longer to dehydrate really moist foods, like bananas. What temperature does a food dehydrator work at? The food dehydrators we reviewed work at temperatures between 95 and 165 degrees Fahrenheit. Most foods can be dehydrated at 130 degrees Fahrenheit, but meat requires a higher temperature to kill bacteria. What are the best foods to dehydrate? You can dehydrate fruit, vegetables, herbs, and even meat. You can turn fresh produce into fruit leather or vegetable chips. Dried herbs make great, long-lasting garnishes for any and every dish. And is any road trip really complete without breaking open a bag of beef jerky? Dried tomatoes, bananas, and apple chips are some favorite dehydrated foods from our test kitchen at House Method. Are dehydrated fruits good for you? Yes, dried fruits make healthy snacks when dehydrated at home. When you use a fruit dehydrator at home, you’re likely using only one ingredient: the fruit, vegetable, herb, or meat that you’re dehydrating. Without any preservatives or additives, these snacks are 100% natural. Dehydration retains most of the food’s nutritional value, minerals, and vitamins. How long can dehydrated food last? The shelf-life of dehydrated foods depends on proper storage (see answer below). If stored correctly, dehydrated fruit can last five years, and dried vegetables can last up to 10 years. Wait for newly dehydrated food to cool before placing them in a container or bag. Vacuum seal containers for an extended shelf-life. Store airtight containers in a cool, dry, dark place. Instant Pot comparisons get messy. New models are released regularly, each one has a range of preset programs, and many customers have reported unclear instructions. To clear up the confusion, our team read the manuals, tested the pressure cookers, and pored over customer reviews to find the best Instant Pots.